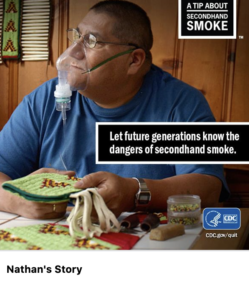 Read stories from people affected by secondhand smoke below. Asian Smokers’ Quitline offers services in multiple languages. Call today to quit or help a family member or friend quit. Join us for World No Tobacco Day! 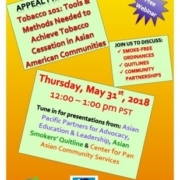 Join us on #WorldNoTobaccoDay 5/31/18 for a free webinar on Tobacco Cessation in Asian American communities! Hear from Asian Smokers’ Quitline and Center for Pan Asian Community Services! https://appealforhealth.org/wp-content/uploads/2018/05/WebinarFlyer-1-1-309x400.jpg 400 309 APPEAL https://appealforhealth.org/wp-content/uploads/2018/07/APPEAL_logo_web_final.png APPEAL2018-05-25 21:31:452018-07-19 13:18:51Join us for World No Tobacco Day! The first day of Lunar New Year is on Feb 16, 2018 and it’s fast approaching! Some of our Asian community members may be busy with getting ready for the Lunar New Year and thinking about a resolution for the year of the dog. ASQ has prepared a pack of lucky red envelopes which will be given to each caller who calls ASQ to inquire about materials on how to quit smoking or to complete an online enrollment to receive a quit smoking service. Red symbolizes good fortune in Chinese and Vietnamese cultures, which is why red envelopes are widely used during Lunar New Year and other celebratory events. To celebrate the year of the dog and to wish everyone will have a healthy start of the New Year, red envelopes will be given out to Chinese and Vietnamese callers from now till February 20th while supplies last! Refer to the ASQ website for more information. Language services available in Cantonese, Mandarin, Vietnamese, Korean, and English! Last week, I was fortunate enough to attend The Institute 2010 in Atlanta, Georgia on behalf of APPEAL where I got the chance to participate in a course entitled, “Addressing Tobacco as a Social Justice Issue,” taught by the amazing, charismatic, and very wise Bill Robinson, Executive Director of the National African American Tobacco Prevention Network (NAATPN) . By the end of Day 1, the class had collectively come up with a working definition of social justice, where everyone has access to healthcare and wellness opportunities, equal economic opportunities, and equal healthcare outcomes regardless of group membership. In other words, equal access should yield equal outcomes for social justice in public health. Conventional wisdom told me that this isn’t the case today-otherwise I wouldn’t be concerned with health disparities. So, where do health disparities come from and how do we address tobacco as a social justice issue? Remember history. Value culture and people. Consider economics. Despite all of the rich material and discussion over three days, Mr. Robinson stressed that all I needed to remember from his course were three things: (1) HISTORY, (2) CULTURE, and (3) ECONOMICS. 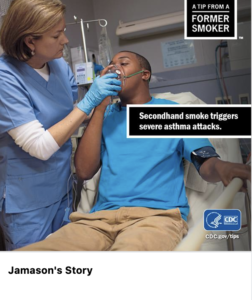 He challenged my fellow classmates and me to consider how the tobacco control movement has been impacted by these things in the past, present, and to consider their implications for the future. I think it is safe to assume that many of us are familiar with the history of slavery, emancipation, or the Break, and the systematic denial of access to opportunities, resources, education, and etcetera to an entire group of free people in the United States. But that’s history right? While this may all seem far in the past, I’m sure many of us can identify current examples of unequal access and social injustice happening in the Black community, as well as other vulnerable populations – LGBT, low socio-economic status, and other communities of color. What is the total impact on health of this historic denial of access to our communities? What needs to be done to ensure that we address avoidable inequities today AND that social justice and health equity are achieved overall? Something Mr. Robinson said about Big Tobacco struck a chord in me: They know me better than I know myself. They know communities better than they know themselves. BIG TOBACCO IS THE MOST COMMUNITY COMPETENT BUSINESS…EVER! Historically, Big Tobacco was at the forefront of reaching out to the Black community – tailoring products for their use and incorporating cultural elements in their product designs and marketing. Imagine experiencing systematic denial of access on a daily basis and then finding a product that makes you feel included and part of society – that you aren’t invisible after all. Today, cultural “hijacking” continues to be a powerful tactic deployed by the tobacco industry. 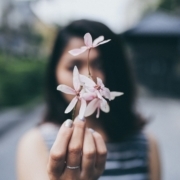 Their product designs and marketing schemes create an illusion of inclusion for historically disenfranchised groups – LGBT folks, communities of color, women, youth. 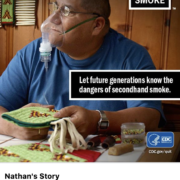 Many of us in the tobacco control movement find these tactics deplorable, but if there is one positive thing I can take home from this it’s that — cultural authenticity aside– wow! community competency works and the industry probably has mounds of data and research to solidify the case. 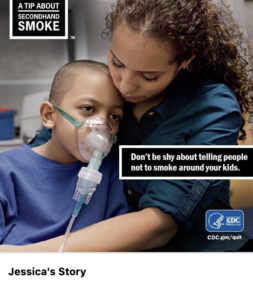 How will we counter the efforts of Big Tobacco targeting our communities? Most importantly, how will we employ principles of social justice, equity and inclusion in the future of the tobacco control movement? FACT: The money that funds tobacco control efforts comes from cigarette taxes, the master settlement, and lawsuits against the tobacco industry. What does this mean for the tobacco control movement – past, present, and future? How do we ensure everyone has access to healthcare and wellness opportunities, equal economic opportunities, and equal healthcare outcomes regardless of group membership? When the course ended, I was left with more questions than answers but felt equipped with a more critical eye for looking at tobacco from a social justice framework. As Mr. Robinson stressed in his course, remember these three things: (1) HISTORY; (2) CULTURE; and (3) ECONOMICS. How else can we apply these when addressing tobacco as a social justice issue? Let the marinating commence!